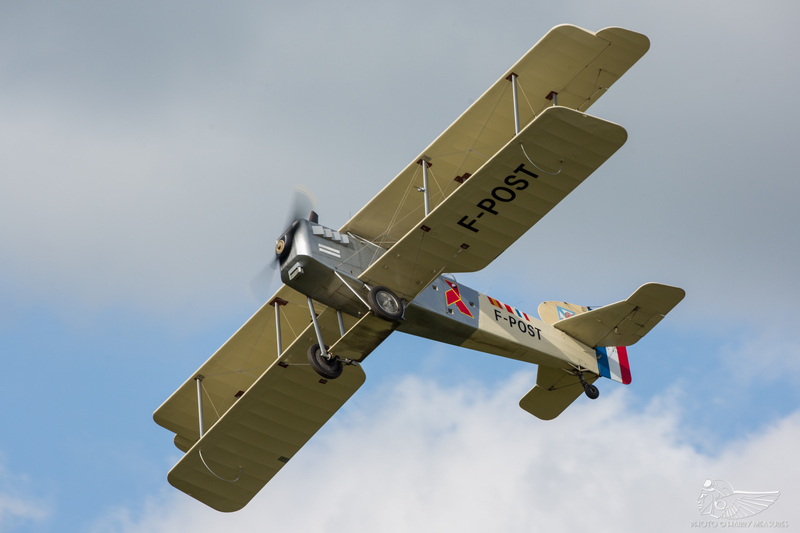 The annual Meeting Aérien at Cerny aerodrome, colloquially known as La Ferté-Alais after the neighbouring town, is world-renowned for its exceptional flying display. Entry to the showground was swift, with even the lengthiest traffic queues moving reasonably quickly. First port of call for many was the aircraft park to the right of the long crowd line. For an additional five Euros (a price which has remained set since my first visit in 2012), visitors could access the extensive aircraft park during the morning. More than 100 aircraft were parked in ‘fingers’ into the crowd, giving the impression of a vast sprawl of aeroplanes from across the generations. The closeness of the barriers to the subjects may have frustrated some photographers, but it allowed the public the best possible access to the aircraft on display and the sheer number of people who took take advantage of the very reasonable ‘flight line walk’ each was a testament to its popularity and value for money. Complementing this were singers who provided live entertainment in the hangar throughout the morning, with B-17 Pink Lady offering a suitable backdrop. 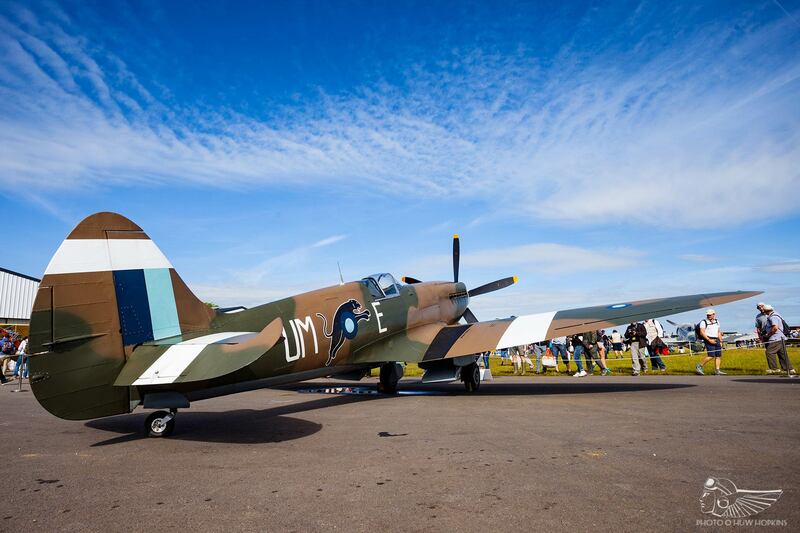 As characterful an airfield as you’ll find, the whole place brims with charm and a heady, infectious atmosphere. 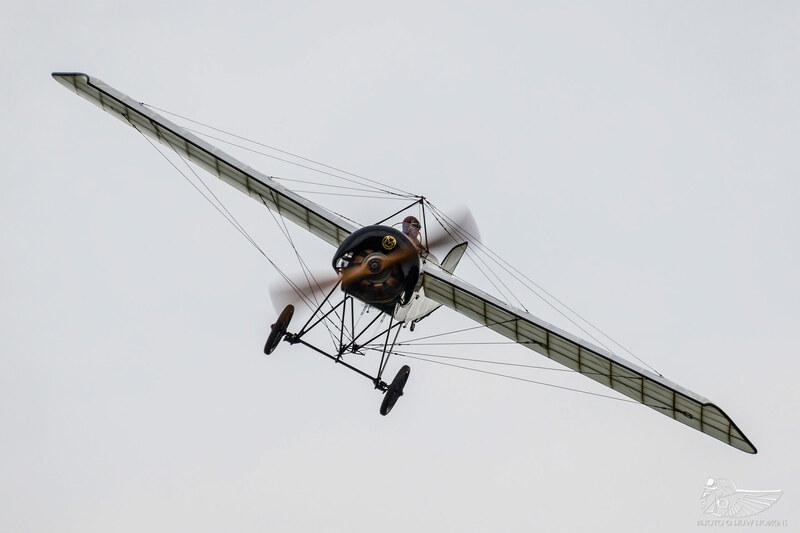 Though Saturday’s flying programme was curtailed by torrential rain shortly after 4pm, Sunday’s dry and sunny conditions allowed a full display to take place with only a handful of cancellations. 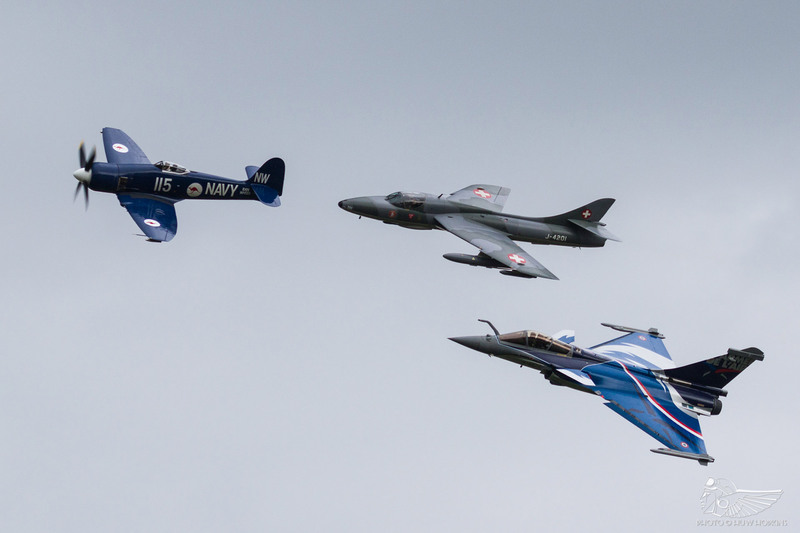 The sheer diversity of acts flying at La Ferté, ranging from the pairing of SG38 and Pilatus B4 gliders to star appearances by an Air France Boeing 777, flanked by La Patrouille de France, and an Airbus A330 (airliner displays – and the latter was most definitely a display, with the 330 making several passes in different configurations – traditionally being a highlight at La Ferté), offers representation of all aviation in some form or another. 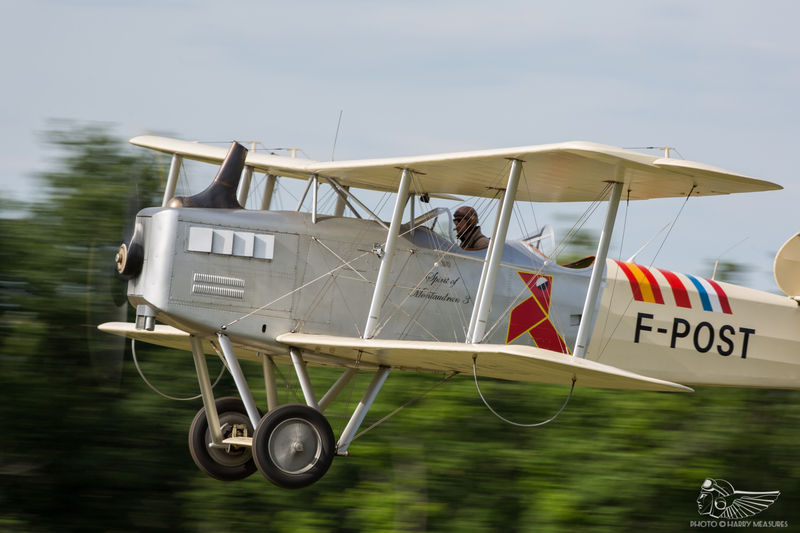 While the heart and soul of the Meeting Aérien is the sizeable vintage contingent, few stones are left unturned when plotting the development of aviation. Take, for instance, the contrast between the aforementioned modern airliners and their 1930s forebears, the beautiful silver and red trim Beech-18 and DC-3 Dakota, honouring the important role played by classic propliners in broadening the world’s horizons and illustrating just how quickly air travel has developed over a short time span. Or, for those who are more aerobatically-minded, the subtle charting of the development of competition and freestyle aerobatics from the 180hp Lycoming engine Bucker Jungmann through to the more advanced routines flown by Pitts S2 Special and CAP 222, culminating with the excellent Armée de l’Air (AdlA) solo Extra 330’s gyroscopic display. 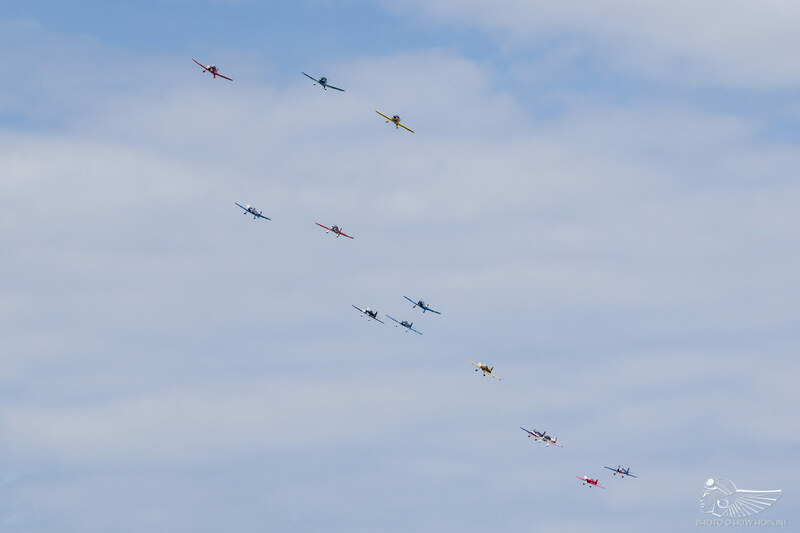 CAPs featured heavily in the flying programme, with an impressive 13-ship formation of numerous variants flying by on each day – one of those unique “only at La Ferté” moments. 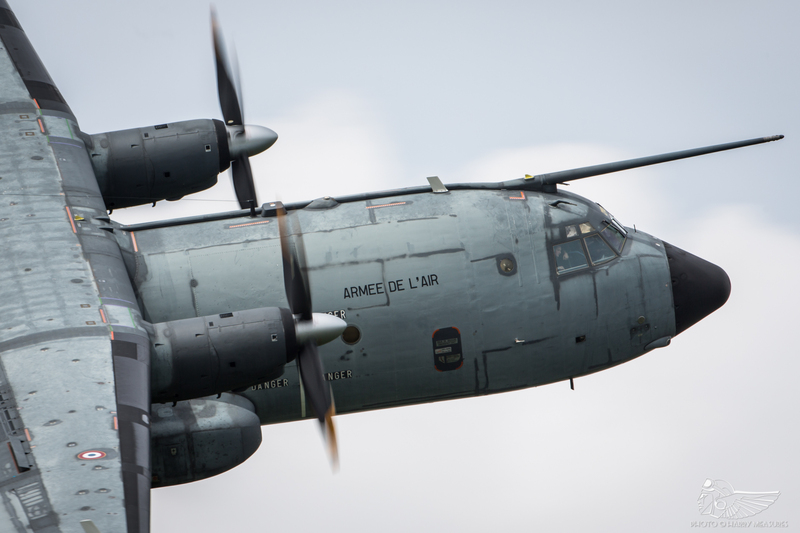 Besides the aforementioned Extra and the typically excellent French national team, La Patrouille de France, the AdlA also contributed the Transall C-160 to the flying programme, offering a very rare opportunity to see this ageing twin-engine turboprop transport in the air display environment. 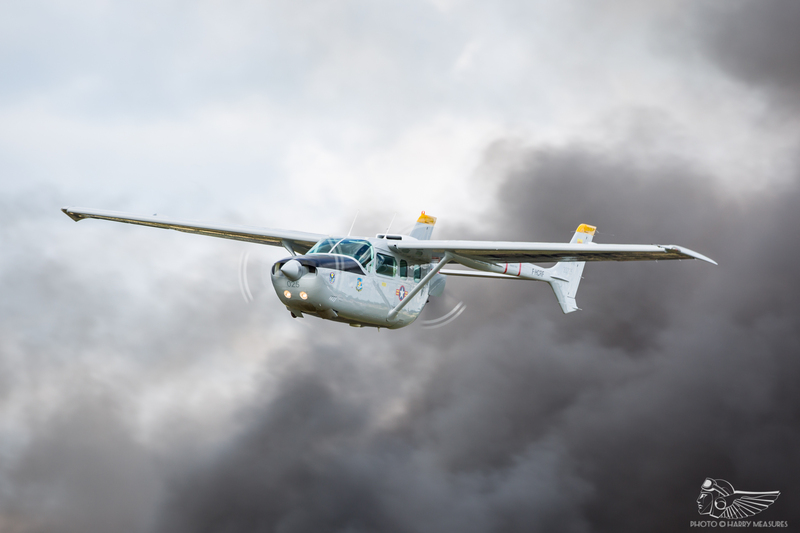 The C-160 gave a short but sweet demo of the aircraft’s capabilities, including a topside pass, overshoots and a low run through straight down the grass runway, each turn conducted vigorously with a keen angle of bank and vapour to boot. Also present was the home team’s Dassault Rafale C demo – perhaps Europe’s finest fast-jet solo – flying full aerobatic displays over the weekend that really illustrated the potency of this charismatic fighter. Unlike many of the current and next generation jets, the Rafale has retained Dassault’s sharp lines, its design putting a modern skew on the classic Mirages of yesteryear. 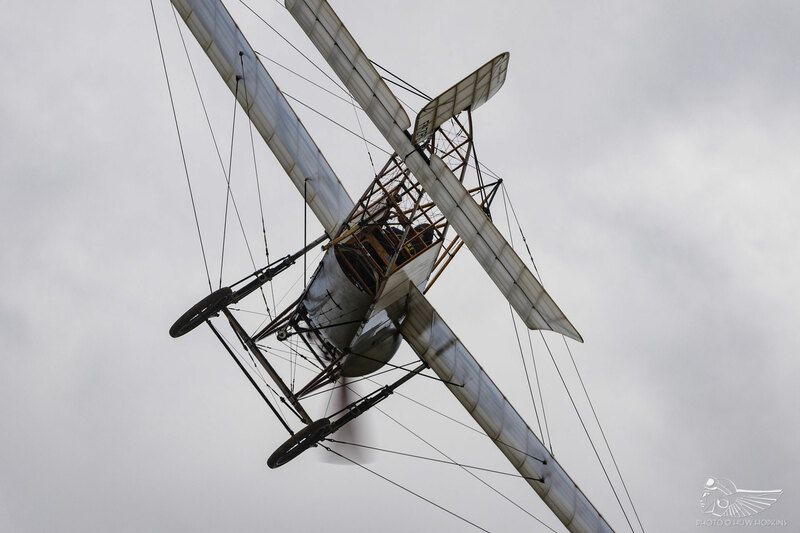 Casting the net back to the early 1900s, “les débuts de l’aviation” segment showcased the wonderful Blériot XI-2 and Morane Type H, which flew together in formation and in a number of close opposition passes – joining them high overhead, a convincing Deperdussin reproduction. A fantastic spectacle. 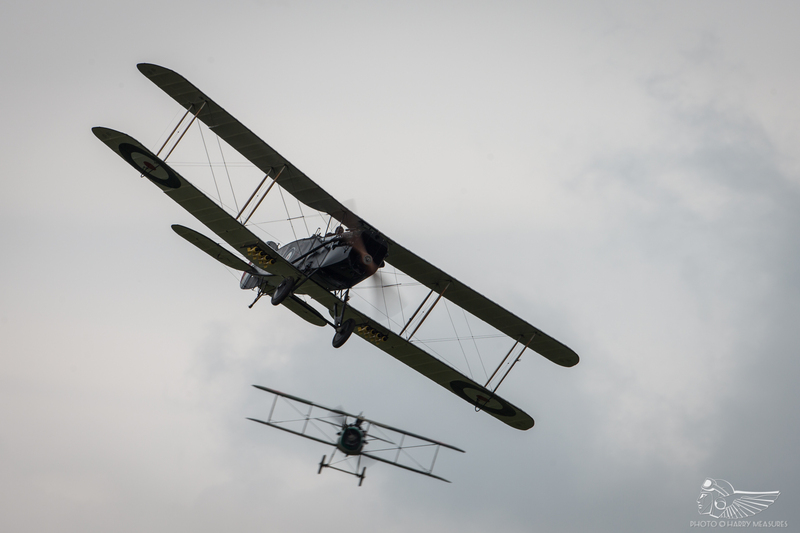 An engaging mock dogfight then took the stage as a pair of replica SE5as (converted Stampes made to look the part) tangled with a replica Albatros (based on a Tiger Moth airframe), the trio rolling, looping and diving all over the place at low-level whilst a quintet of Stampes and Jungmanns flew high overhead in formation (an effective means of building a layered sequence). 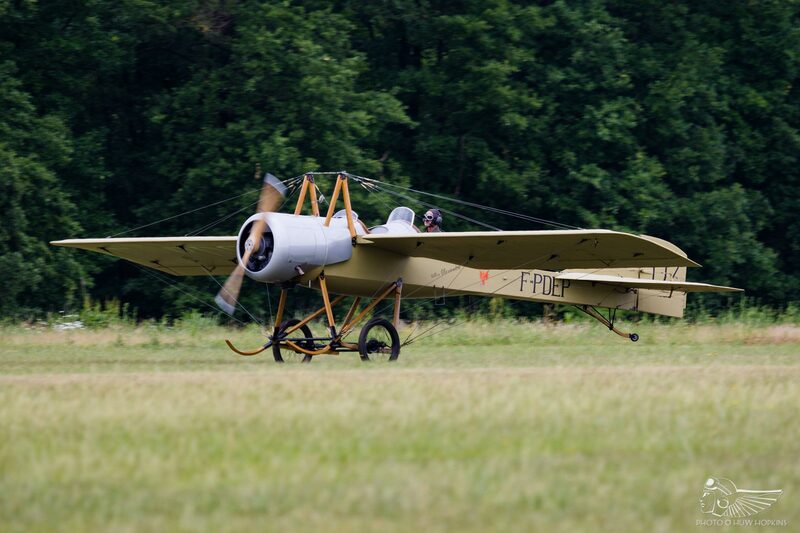 Saturday also enjoyed a spirited appearance by the Memorial Flight’s LFA-based SPAD (Société Pour L’Aviation et ses Dérivés) XIII, which joined the rugged Hispano Suiza-powered Bristol F2b. The Memorial Flight’s Great War fleet is all too rarely seen, and catching the SPAD on Saturday was a real highlight of the weekend. Beautifully flown it was too by Edmond Salis. The Fokker D.VII and Sopwith 1 ½ Strutter sadly did not fly, but could be enjoyed at close quarters during each morning’s live side walk. 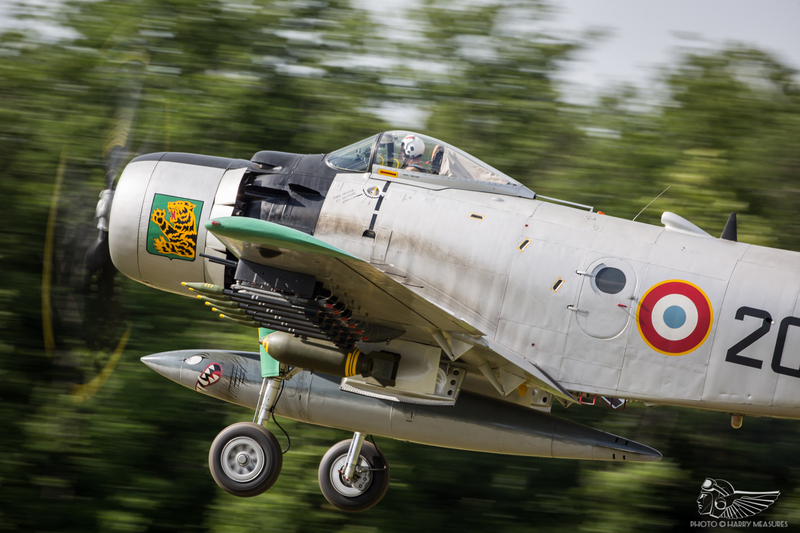 Making a much-anticipated appearance at La Ferté-Alais was the positively awesome Breguet XIV, flown by Baptiste Salis late in Sunday’s flying display.  Vintage aviation enthusiasts were very well catered for with a number of set-pieces involving classic aeroplanes of the 1930s. 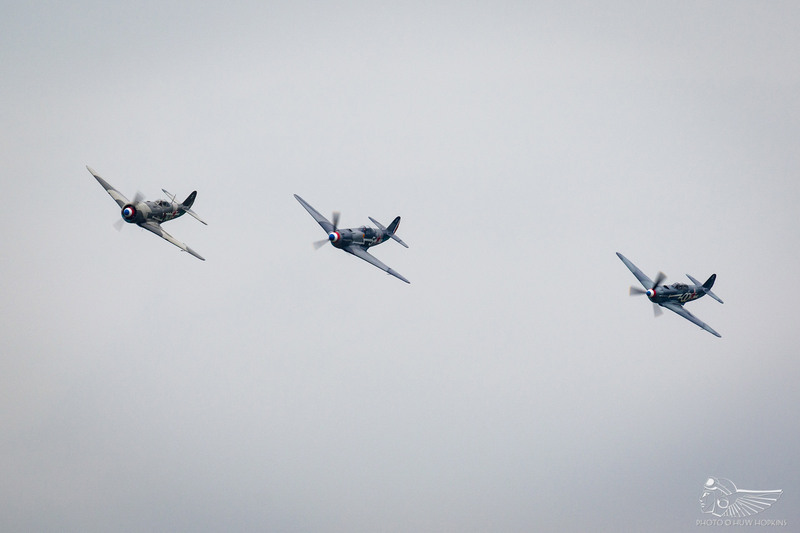 The trio of Stinson Reliant, Ryan SCW and Laird Speedwing was one of the delights of the flying programme. 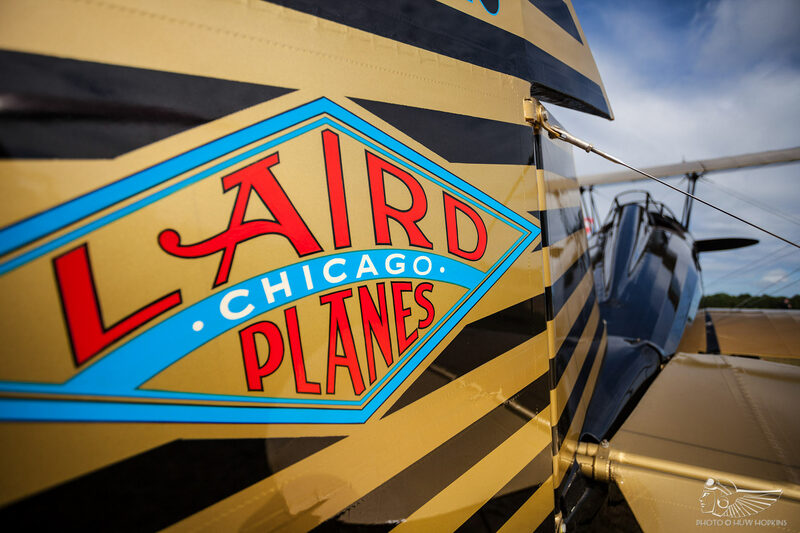 Steve Carter’s gorgeous Ryan (visiting from Australia by way of the UK) and Jan Roozen’s Laird were both making rare airshow appearances – two absolute treasures to savour. 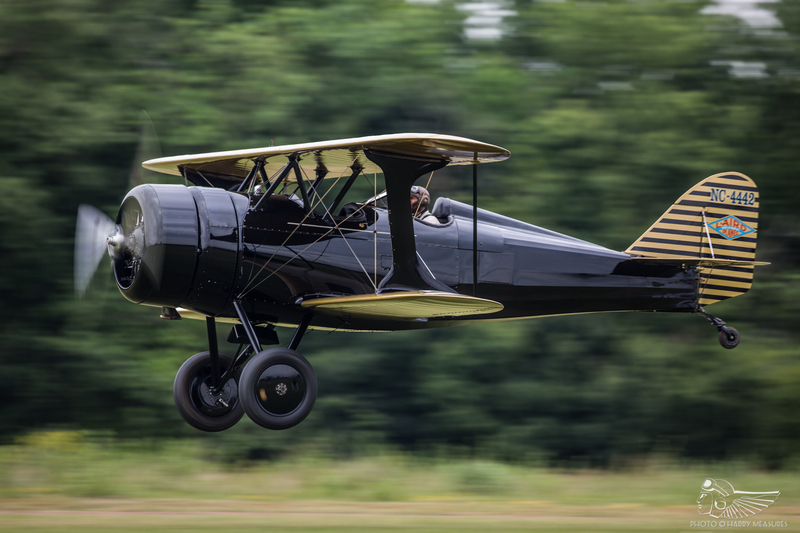 The latter’s full aerobatic display of loops and rolls was particularly impressive, although one gets the impression that the Speedwing is capable of so much more! 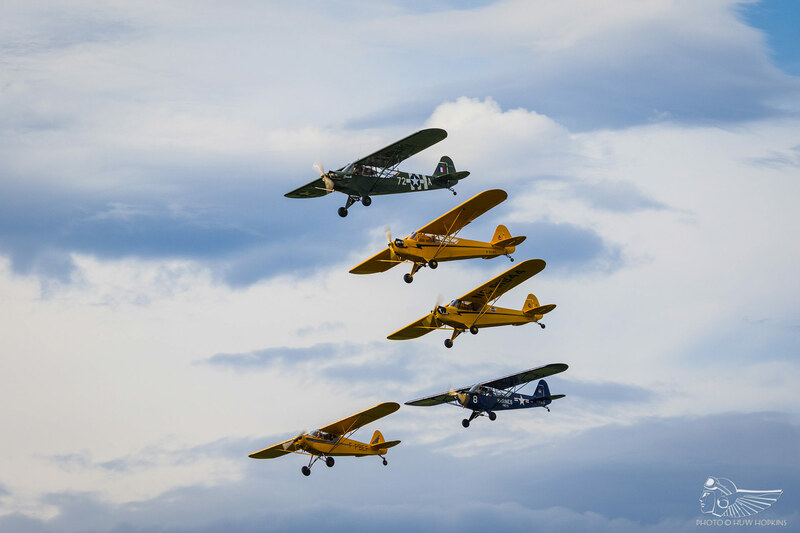 A quintet of Piper Cubs also assembled for an 80th birthday salute to Jean Salis, with each of his sons – Jean Jr, Edmond, Baptiste and Franck – flying the aeroplanes in formation. Their five-ship passes and on-crowd peel break, flown to Michael Kamen’s Band of Brothers theme, were surprisingly evocative and illustrated the fact that La Ferté is very much a family affair for Jean Salis and his kin. La Ferté-Alais always delivers on the big piston front; 2017 was no exception with a number of warbirds from different theatres participating. 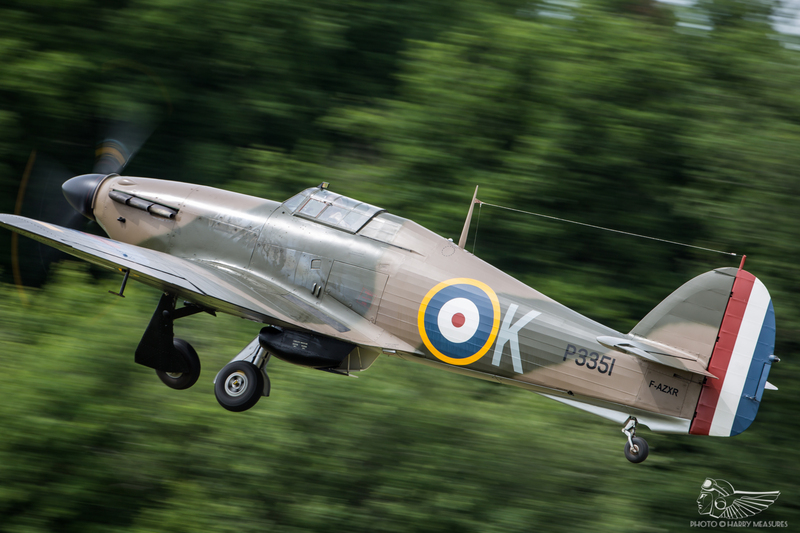 Second World War British aircraft are always well-received by the French audience, and that was certainly the case with the pairing of Jan Roozen’s Hawker Hurricane Mk.I P3351 and Christophe Jacquard’s Spitfire PRXIX. It was fantastic to see the Hurricane back at La Ferté and Bruno Ducreux demonstrated the aircraft in a strong routine. 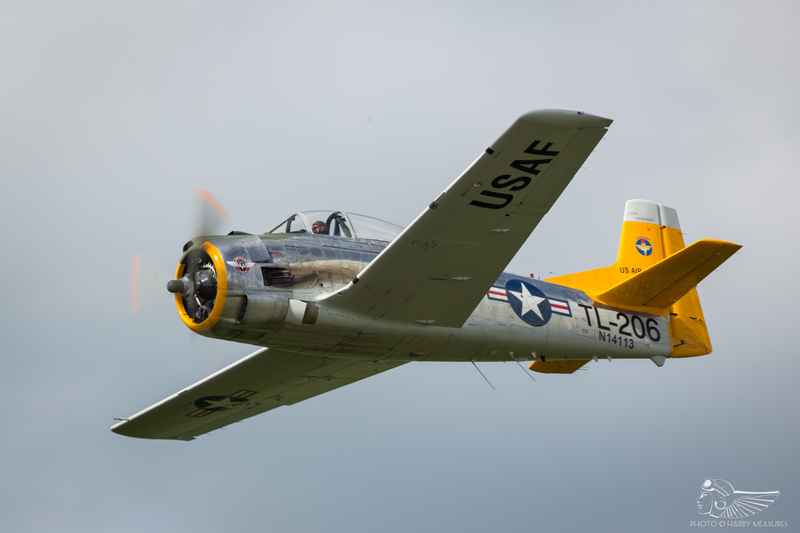 Elsewhere in the programme, Rolf Mueum displayed The Fighter Collection’s Curtiss Hawk 75 and George Perez flew Melun-based P-51D Mustang Nooky Booky IV in his inimitable style. A quartet of Yaks (three -3s and -11 displayed here) commemorated the Normandie-Niemen action on the Eastern Front in a fighter sweep and tail chase, with two of the Yak-3s ‘shooting down’ the Junkers Ju-52 (which had previously displayed in tandem with a Fieseler Storch) before entering their own displays. The subsequent tail chase between the radial single seat Yak-11 and Stéphane Canu’s beautifully presented Yak-3 was particularly spirited. 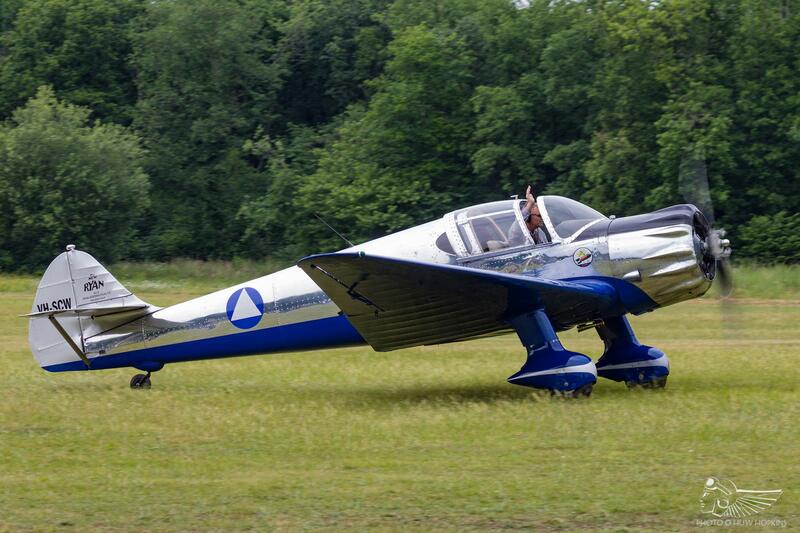 Many had hoped to see Will Greenwood’s striking Yak-3 G-OLEG playing a more prominent role in its La Ferté début; alas, the aeroplane was allowed just two passes before it landed back on. One of very few disappointments in an otherwise stellar flying programme. America’s entry to the Second World War was depicted by the theatrical – and highly effective – Tora! Tora! Tora! set-piece with 11 T-6 variants (including single examples of the NA-68 and a modified Zero replica) laying siege to La Ferté amidst impressive pyrotechnics and appropriate musical accompaniment. 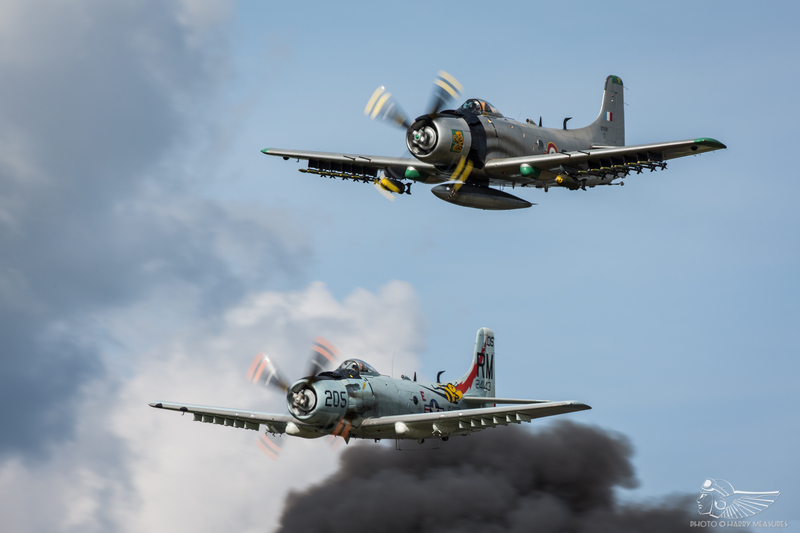 Following a prelude featuring single examples of the Stearman and N3N, the T-6s returned to initiate the attack. Their diving peel attacks through thick black smoke with fiery explosions beneath and pumping orchestral music is always a high point – there is nothing quite like it in Europe, and with enhanced numbers this time round, the whole display was a terrifically engaging piece of airshow theatricality (albeit one you simply cannot do justice to photographically!). The sequence concluded with a P-40 Kittyhawk scrambling and intercepting the ‘Zero’, culminating in a brief on-on-one mock dogfight as the other T-6s landed. 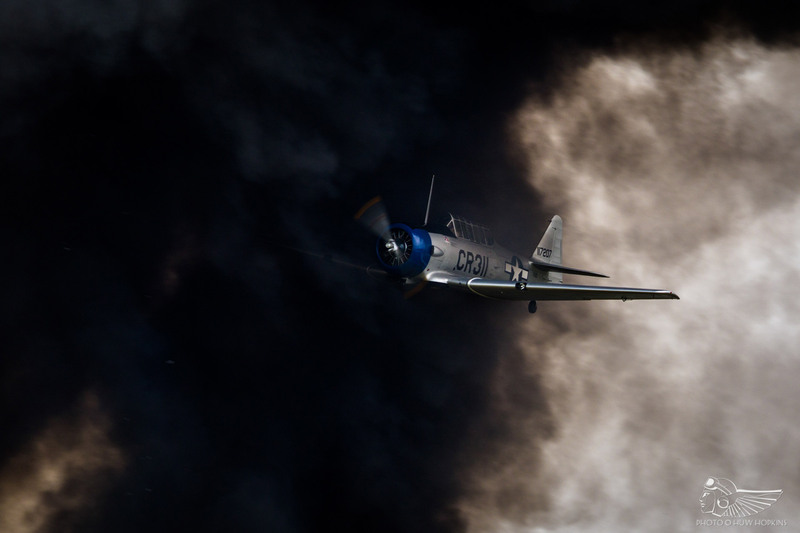 Rather than a succession of individual solos, the organisers typically produce choreographed set-pieces with multiple aircraft to help portray an important event in aviation or world history. The ever-popular Vietnam set-piece, for example, saw pairs of Skyraiders and T-28 Fennecs attacking the airfield with strafing runs, pyrotechnics and appropriate music (Hendrix, The Doors etc.) whilst a Skymaster “push-pull” carried out a string of low-level fast passes down the grass runway, adding context to what would otherwise be disconnected display acts. Single examples of each type flew powerful solo routines (the AJBS Skyraider positively tearing the sky apart with aggressive vertical aerobatics and Baptiste Salis giving the new T-28 a fine début outing) and all four radials flew by in formation to round off this tremendously entertaining sequence. Memorable too was the pairing of Hawkers Sea Fury and Hunter, with Patrice Marchasson leading a spectacular close formation aerobatic sequence in the ‘ultimate big piston’ before each flew solo. Close, fast and exuding grace and power, this was a truly excellent duo that will live long in the memory. The Hawkers also flew by with the Rafale demo aircraft, the formation illustrating three generations of fighter development. This epitomised the contrasts and variety La Ferté is famous for – whether it’s 46 Aviation’s Stearman flying an aerobatic wingwalking sequence, Patrouille Tranchant’s Fouga Magister pair providing lyrical close formation aerobatics or the combination of CAP 10, Fouga Zephyr, MS733 pair and Breguet Atlantique representing the past and present of the Aéronavale, the flying display is always taking dramatic and surprising twists and turns through the annals of aeronautical history. This highly effective storytelling elevates La Ferté above many other events – seldom will you find such thought given to a flying programme. 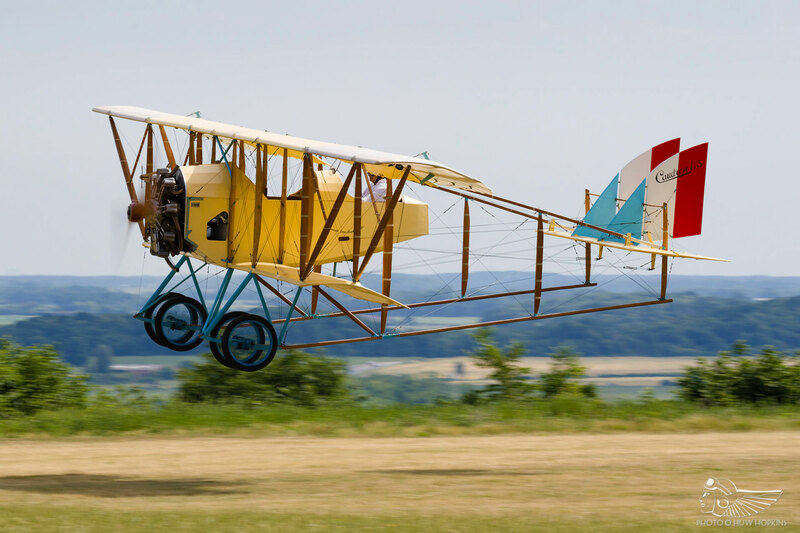 As the near six-hour air display drew to a close on Sunday evening, the Caudron GIII and Blériot got airborne for the second time to bid the capacity crowd adieu for another year. As they wheeled about the sky in the best light of the weekend, James Horner’s soulful Apollo 13 theme played out over the loud speakers and a vintage motorcycle rode up and down the crowd line, its rider waving a huge French flag. 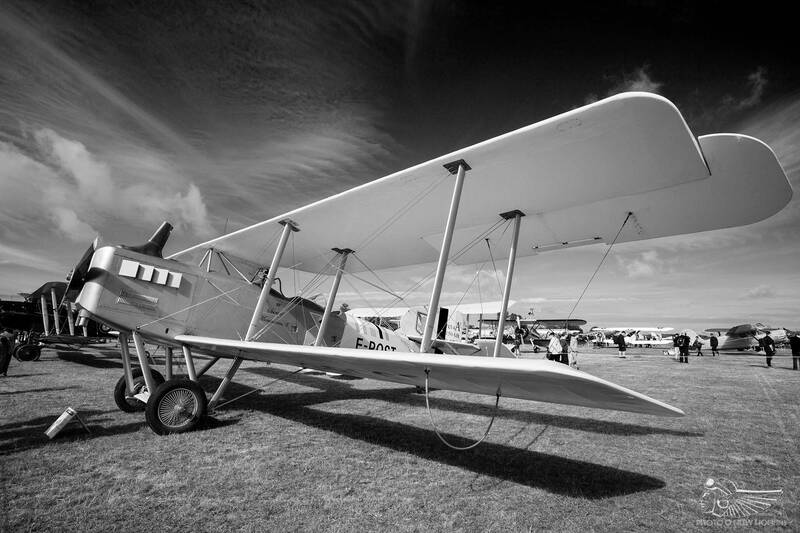 This unashamedly Gallic and really quite stirring denouement brought the curtain down on yet another tremendous instalment of one of the world’s very best airshows, where the purity and beauty of flight is triumphantly celebrated in all its forms.